Mepak offers specialised furniture and services to create working environments. It’s the result of established professionals coming together with open minds and the experience gained in their respective fields: communication, interior design, construction, industrial shelving, office furniture and computer services. Mepak’s added value is its multidisciplinary approach and vision. This means we can interpret technological innovations and methods in order to meet the specific needs of our customers. Mepak pays great attention to protecting the environment. All of our services, from management controls to processes, are characterised by devices that improve energy consumption, such as inverter systems and LED lighting, and the materials used are 100% recyclable. Mepak offers only top of the range products and services, at competitive prices. We cater to large, small and medium-sized companies. But we want to be a reference point for all companies offering services and that need highly specialised furniture at short notice, with maximum reliability. 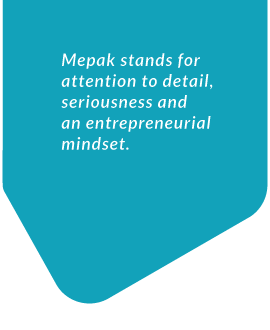 Mepak stands for attention to detail, seriousness and an entrepreneurial mindset. But above all, competent professionals who create unique working environments.